The PV® 112 is a two-way speaker system based on a 12" heavy/duty woofer and a RXTM 14 titanium diaphragm dynamic compression driver mounted on a 60 by 40 degree coverage constant-directivity horn. The lightweight-yet-rugged, carpet-covered trapezoidal enclosure with stand-mount cup facilitates portable use for live music or speech sound reinforcement, as well as music playback. A full-length black power-coated steel grille provides driver protection. 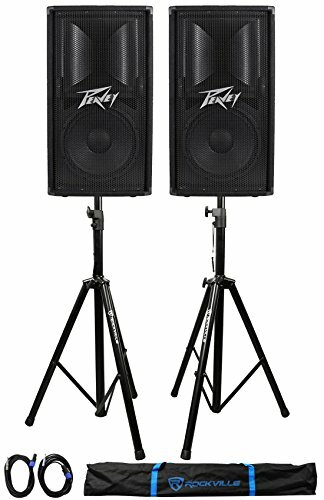 The PV® 112 speaker system is rated at 400 watts program power handling, and the full crossover network includes high voltage film caps and dynamic tweeter protection for clear, punchy sound, and excellent long-term reliability. Two 1/4" phone jack input connectors make hook-up a breeze. Two-way sound reinforcement enclosure. 12" heavy/duty woofer. RXTM 14 titanium diaphragm compression driver. Dynamic tweeter protection. 400 watts program/800 watts peak power handling. Heavy duty crossover network for driver protection and EQ. Lightweight trapezoidal enclosure. 60 by 40 degree coverage constant-directivity horn. High quality, heavy/duty carpet covering. Steel handles. Steel corners. Rugged dado and rabbet construction. T-nut speaker mounting. Heavy/duty full-length steel grille. Steel mount cup. Weight Unpacked: 45.00 lb(20.412 kg). Weight Packed: 50.00 lb(22.68 kg). Width Packed: 14.62"(37.1348 cm). Height Packed: 29.06"(73.8124 cm). Depth Packed: 15.87"(40.3098 cm).